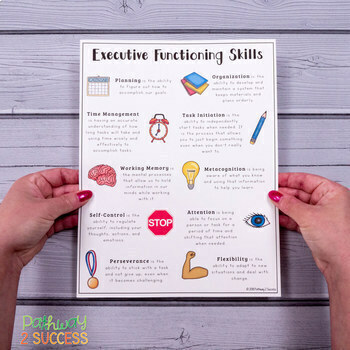 Use this free executive functioning poster to highlight each specific executive functioning skill. Skills highlighted include: planning, organization, time management, task initiation, working memory, metacognition, self-control, sustained attention, flexibility, and perseverance. 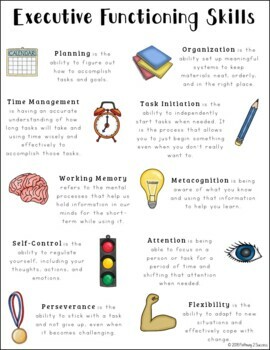 Post this page up as a reminder for adults and kids about the importance of executive functioning skills. Note that both black/white and color options are included! Target executive functioning and study skills necessary for academic success at the middle and high school level. The bundle includes over 300 pages full of lessons, templates, and workbook pages to teach study strategies and ways to improve executive functioning skills. It includes many of my executive functioning and study skills materials in one place. Teach specific executive functioning skills with this advanced workbook, including: planning, organization, time management, task initiation, working memory, metacognition, self-control, sustained attention, flexibility, and perseverance. 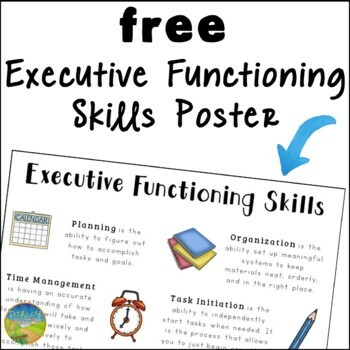 Detailed information, examples, practice, and fun activities are included for every executive functioning skills. With over 120 pages, you will have everything you need to teach these skills thoroughly!